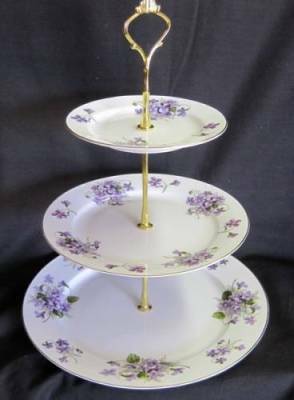 Delicate clusters of wild violets gives this two tier bone china tray by Royal Victorian a pretty spring look. The top plate is 6" round, the middle plate is 8", the bottom plate is 10" and all are trimmed in gold with brass finish metal fittings. The tray is trimmed in gold, so is not microwave oven safe.